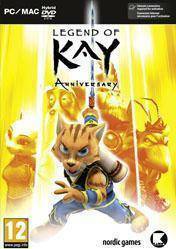 Buy Legend of Kay Anniversary cd key for PC in digital version at best price is already possible via Gocdkeys! You can now compare prices of digital serial for Legend of Kay Anniversary for the Steam platform (or GOG, depending on the store where you buy it). To activate the download from Steam, you must add the digital serial of Legend of Kay Anniversary in your "Games Library". Reaches to Steam the fully updated version of Legend of Kay, launched about 10 years ago. This new remastered version comes with an impressive improvement in its textures, with high resolution graphics, new models, and sound effect that makes this classic title to another level. Legend of Kay Anniversary is an incredibly fun and challenging action game, hat will delight all those who enjoyed this classic almost 10 years ago. Among the highlights of this new version, we can find a total of 25 levels that fight epic enemies, 3 different types of weapons, from swords to ninja grasp, lots of mini-games like racing boar and dragon, and a full multiplayer mode, with global rankings to see our scores. Remember that there are several versions of this title, so we recommend reading the information about download methods in each store. There are no comments yet about Legend of Kay Anniversary . You can be the first one!